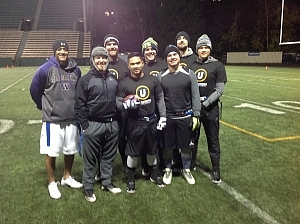 Brandon Bailey of Irregular City Tossers showed up to play championship football on Monday evening and it showed. Striking early and often, Irregular City found themselves ahead and in control for the whole game. Bailey tossed 5 TDs en route to the championship victory over Inbound Hounds. With that being said, big shout outs to the #8 seeded Inbound Hounds for making it to the championship game after winning the semifinal game with a Hail Mary touchdown on the last play, as well as defeating the top overall seed the week before. Congratulations to the Irregular City Tossers and thank you to all who came out for another great season!